For something seasonal, skip the chocolate fountain and serve a colorful fruit fondue for your New Years Eve party. 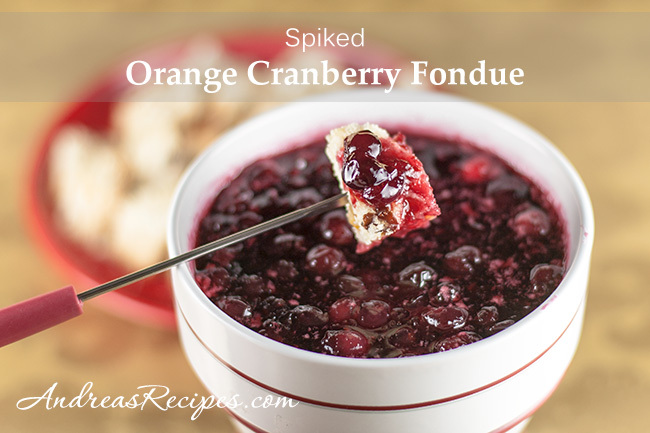 This spiked fondue lends some beautiful color to a New Years Eve buffet and and is an easy and fun dessert. For dippers, set out apple wedges, dried pineapple slices, panettone or fruit cake chunks, or madeleines. Adapted from Great Party Fondues, by Peggy Fallon. In the sauce pan, combine the cabernet sauvignon, sugar, and orange juice. Stir and add the cinnamon stick. Bring to a boil over medium-high heat, stirring until the sugar dissolves completely. Add the cranberries and stir, cooking over medium heat. In the small bowl, stir together the Grand Marnier and cornstarch. When the cranberry mixture reaches a boil, stir in the cornstarch mixture and bring to a boil. 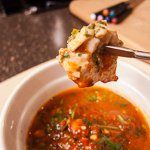 Reduce heat to medium-low and simmer for about 3 minutes, stirring frequently. The mixture should thicken slightly. Discard the cinnamon stick and transfer to a ceramic fondue pot. Set over a low flame, such as a tea light and serve with dippers. Oh what a great idea! I have some cranberry relish in my freezer right now. I can easily thaw it out, add a few ingredients and add it to my buffet table this evening. Thanks! 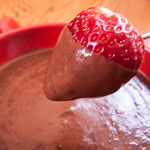 When I think of fondue, I think of cheese, or chocolate. This is a lovely change — fruit, tart, and red! Best wishes for a delicious 2009. I love this idea, I would have never thought to do something like this. All the best in 2009! This would be luscious served as a warm accompaniment to a wheel of brie.